New market opportunities, the importance of market data, and cultivating end-user relationships: these were key takeaways from the AVIXA AV Executive Conference (AVEC) that convened last week in Tampa, Florida. 200 executives from across the professional AV industry gathered for strategic business planning, best practices sharing, networking, and community celebration. 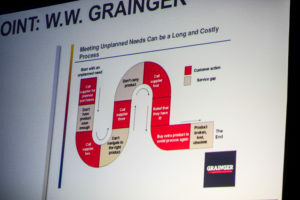 AVEC also provided the unique forum for end users to speak candidly about their needs, sparking new ideas and new ways to add value to the vendor-client relationship. Here are three refrains from AVEC’s high-level gathering. Dan Goldstein, AVIXA’s senior VP of content and communications, was inspired by the event’s content, explaining that AVEC was a “great proof of concept” for the organization. 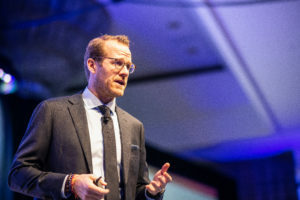 Enterprise AV has been a stalwart vertical, but during AVEC’s ‘Global Economic Outlook,’ and ‘Market Intelligence Report,’ attendees learned that global growth markets include education, retail, healthcare, and hospitality. Andy Banerjee, managing principal of Business Analytics & Forecasting, IHS Markit, and Sean Wargo, senior director, Market Intelligence, AVIXA, drilled down into new data points. They also shared the broader narrative told by the data: AV is at an inflection point, with robust growth predicted through 2023. Brad Grimes, AVIXA’s senior director of Communications, explained that better intelligence can lead to deeper insights into AV products, services, and trends. Pertinent data—with context—is “foundational to making decisions,” he emphasized. AV leaders are busy and may not have the internal bandwidth to conduct their own research. AVIXA strives to conduct and offer more market intelligence so members can digest and leverage the insights during strategic planning. “AVIXA is the authoritative source for market intelligence,” Grimes said. Through strategic partnerships such as the AV User Group, AVIXA intends on bringing decision-makers and integrators together to share best practices and learn each other. In AVEC’s core tracks—Enterprise, Corporate, Retail, and Education—leaders from diverse fields such as workplace strategy, architecture, and design shared candid perspectives as they strive for more human-centered and intuitive technology experiences. 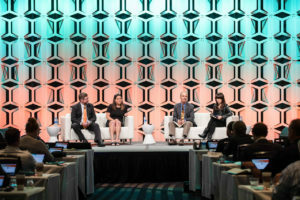 Influential end users such as Michael A. Judeh, CTS, of Convene and Kay Sargant of HOK took the AVEC stage to articulate their workplace needs, laments, and internal strategies. AVIXA believes that candid end-user viewpoints can help cultivate more valuable vendor partnerships. What is also clear is that technology managers are become more skilled and knowledgeable. To that end, vendors are exploring AVaaS, agile cloud offerings, new service models, analytics, and remote monitoring as ways to add value to existing client relationships. AVEC’s breakout sessions provided deep dives into emerging opportunities like experiential design and the convergence of installed AV and AR, AI, VR, and IoT. While conversations of this ilk are still nascent for some AV stakeholders, the potential is exciting. “AV products and services are the enabling technologies for new experiences and new markets,” Harriman added. Growth potential extends to “traditional AV” vendors, as well. Market intelligence and conversations with end users can spark new ways of seeing or approaching core AV applications. “We’re showing how AV can create different outcomes, and how dealers can save time by identifying new market opportunities,” Grimes said. 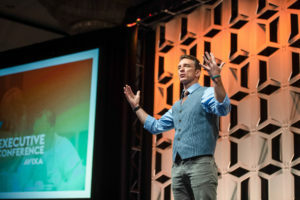 To learn more about AVEC, visit www.avexecutiveconference.com. AV pros, did you attend AVEC? What would make the next conference even better? Tweet your feedback to @AVNationTV. Margot Douaihy is the editor-at-large of AV Technology magazine.